To log-in to Lexbe eDiscovery Platform, you click the Log-in link in the upper-right corner of your main page (eDiscovery.lexbe.com). From there, you will be taken to a log-in screen in which you will be prompted to enter your user name and password. The User Name should be your email address. Note: Lexbe eDiscovery Platform works best with the two most recent versions of Internet Explorer or Firefox. If you use an older version not all functionality may be available. If you would like to remain logged in for an extended period (up to several hours), then click on the check box next to 'Remember me next time' or you can choose to ‘Remember User Name’ for the next lo gin on the same computer. This allows you to open multiple browser windows (same browser) and not have to log-in again for each of the new windows. You can also close your Browser and open it again and you will still be logged in. You don’t have to type in your password for as long as the lo gin session remains active. This feature reduces your security so it should be used with caution and only on a completely secure computer. The 'remember me' functionality is not intended to remember your user name or password between sessions. Instead it is meant remember this information within a session. By design Lexbe eDiscovery Platform does not maintain your password between user sessions for security purposes. This functionality would require storing your password on your local computer. As with bank accounts, we feel this is too big of a security risk if a computer were stolen. 'Remember me' would be better described as 'Stay logged in' (during a session). Lexbe eDiscovery Platform works best with the latest versions of Internet Explorer and Firefox on the PC and Firefox on the Mac. If you are having trouble, please make sure that you have the latest major browser release installed. After a browser update a system reboot may be necessary. 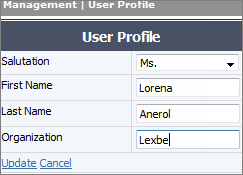 If you click on ‘Update User Profile’, it will prompt you to edit your user profile (salutation, name and organization). What do you do if you forget your password? If you cannot remember your password, click on the 'Recover Password' link within the Log-in box and submit your request for a new one. From there you will receive a message informing your password has been reset. The new password will be sent to your email address and you might need to check your spam filter too. The message shows the new password you will be able to log in, using your email address as your user name. Be careful when copying the new password to not include any extra spaces at the end. Once logged in, you can then change your password to something more memorable. You may change your password clicking on 'Management Section' from the main menu. Do not attempt to guess your password more than four times or you will be locked out of the system (for security purposes) and will need to contact support to reset your password. If you forget your user name, please contact us at our Support Center. If you still cannot log-in to your Lexbe eDiscovery Platform account after following the steps mentioned above, please contact the account Admin users. This situation might happen if you don't have cases assigned to your account anymore. For security reason, only the Account Admin users can assign cases and grant you access to Lexbe eDiscovery Platform. If the problem still persists even after re-assigning cases back to your user account, please contact our Customer Support. This function is only available if you are the 'Administrator' of your case account. For more details, please open the 'Management>Change Password' page. After 3 hours of inactivity your session will expire and you will be logged off automatically. This is part of Lexbe eDiscovery Platform security precautions to keep your account safe. Lexbe eDiscovery Platform maintains state-of-the-art security to ensure that customer documents are never compromised. Data security is our top priority and our redundant infrastructure, multi-level application controls, and strong in-place and 256-bit SSL transfer encryption deliver the highest levels of protection for your legal electronic stored information (ESI).